in awhile. Some of the programs may no longer be available. If you are a beginner or not too good with Computers, it can be confusing deciding which camera, capture card, what features you should consider, and how to put together a Stop Motion set-up that will work. You can go here How do I Record-Film Stop Motion? I am not an expert at this but I am good at research & dissecting the mish-mash of excess information and then make my own evaluations & conclusions. This is from my perspective only. I made an attempt 'explain' but it might be confusing for virginal newbies. After you read the above link ..... come back here. The following are not detailed reviews of the of the Stop Motion capturing/recording software-tools, but more of my general comments and I am not going to be too critical. Software here covers PCs and some Macs (not as many though). You should be thankful that there are a minority few software authors, who have made the effort to produce such programs for this unique & esoteric animation art/craft. They are also affordable and most all of them offer a trial limited demo to test their software. ALWAYS .... FIRST look at the Software's Minimum System Requirements for your computer to run the software. For PCs, most of these programs require the latest version of Windows DirectX .... free download (read DirectX ABCs) but usually, it is "already" installed in Windows. You should be aware that most of programs will save your final animation as an AVI movie file which are large ..... 360 full 720x576 bitmap frames can occupy approximately ONE Gig of Hard drive space. One usually downsizes them, converting them to compressed QuickTime or Windows Media format .... or you transfer or burn the movies onto VCD/DVD to free-up your hard drive space. Most of these programs do not work with consumer digital still cameras. You will need to use consumer DV camcorders or Webcams. If you cannot afford a DV corder, then for just "practice" animation, most USB Webcams will work. If you want higher quality Webcam, read this. Only "some" Stop Motion Software are "freeware". You should encourage these software developers by trying their products. If you like it .... then just pay the reasonable affordable cost for the program. Do not whine or complain that these are too expensive. Instead of asking, "Which is the best program? ", it would better if you just test them yourself and do not rush it. Each program has different combination of features and user interface. Play with each of programs for a few days. Most all the programs come with "Un-install". If you want to be sure, contact the software company to check if you can easily un-install. Try the programs that interests you, one at a time .... download it .... test it .... un-install it (remove it), then try the next program of your choosing. Stop Motion Pro .... was one of the first trailblazing software products back in 2000 year, to offer to the public, a completely dedicated & specialty Stop Motion program for the Stop Motion hobbyist, practitioner, and for pro use. It has quite a number of very specific and beneficial features for the Stop Motion specialty that can meet demands of experienced Stop Motionists. Has audio lip syncing feature. It is for PC-Windows. You can use DV camcorder (Firewire connection), USB webcams (USB connection) and Analog camcorder (if you have analog video capture card). Stop Motion Pro can control some Digital Still Cameras, too. Many other features listed at their website. They have good online support & video tutorials. A trial demo version is available for you to test it. If you decide to purchase it, you will get the full version at a reasonable cost Stop Motion Pro, They are also working on an HD version of Stop Motion Pro to capture uncompressed HD Video. It will not be a low cost set-up for everyone (very pricey HD capture card) and you will need extra computer power. Good choice maybe for the higher budgets in doing professional stop motion work and also for those just compulsively seeking, "HD Nirvana"
Stop MotionMaker for PC-Windows. The user interface is very user friendly. The software developer originally designed this software for children-schools-e ducators and they want to maintain this simple user interface concept. Do not be deceived by its simple looks. Stop Motion Maker has some strong features .... onionskin, toggling-review of stored frames, rotoscoping, delete/replace last frame, loop last frame, instant preview of animation, frame markers, time lapse, and simple chromakeying /compositing. Connection choices for USB Webcams, DV Camcorders (firewire), and Analog (if you have analog capture card) ..... has video compression and de-interlacing. Again .... the user interface is really straight forward and great for beginners, young & old and even for experienced The only Stop Motion capture software that has a flicker reduction feature. 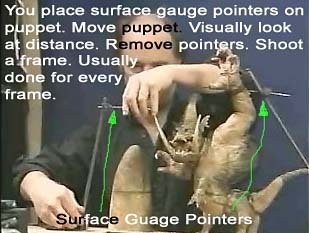 Stop Motionists or anyone that wants a good basic Stop Motion program without complexity. Free trial demo download is available. Go to Stop MotionMaker Update: New Stop Mo software Stop MotionMaker HDMI, which is capable of using High Definition camcorders. Anasazi Stop Motion Animator is freeware for PC-Windows. This is Old Software from some years ago. I guess, because it is Free, people tolerate its glitches. I have done quick test of Anasazi. This software is only for use with USB Webcams or Analog Camcorders (if you have analog capture card). You cannot use DV Camcorders or any Firewire type connection with Anasazi. The important features are, its onionskinning, back & forth frame toggling, looping, instant preview of your animated scene,, adding markers, you can set hot keys, and some other good features. With Anasazi you cannot delete or replace frames. One of the spec requirements is that you need Microsoft's old Video for Windows which Windows usually already has on your systen but is now superceded by the newer DirectShow as part of Windows DirectX Anasazi Update: Someone contacted me and says there is a fix for Anasazi so that it can work with DV Camcorders. It requires downloading/installing a codec, specifically, the Panasonic VFW, DV Codec. Do not ask me if it works with all DV camcorders. Just try it then let me know if your DV camcorder works with it. Also, supposedly, some are trying to do an update of Anasazi which would also run on Macs. StopIt .... was written by someone for his own personal use but is offering it for free. It is for PC-Windows and it is a most basic and very simple Stop Motion software. There is no website for this program. He originally posted and announced his software program at the Stop Motion forum and he gives more details about the program. At the time, he was thinking about adding some features (such as rotoscoping) but there has been no update about it. StopIt appears to be user-friendly with minimal bells & whistles, however, looks good enough for good ol' practicing and learning Stop Motion. Again, it is free. If he thinks no one is using the software, it might not be available later? UPDATE 2010 New Website: StopIt. Frame Thief capture software is for Macs using DV Camcorders or Mac-compatible Webcams, and Mac-compatible capture cards. 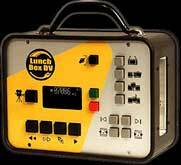 Has all kinds of bells & whistles and has a serious professional interface. It includes a lightbox which does the same as onionskinning and you can toggle through the frames. Another powerful feature is Frame Averaging; improves the video image even from a webcam. Has audio lip syncing feature. It also has some other features where you can have limited control of "some" digital still cameras. It is my understanding, a lot of pro's who are Mac-philes use FrameThief. This is a shareware program and you can test it for 30 days. If you like it, you then buy it. Website: FrameThief Update: I hear that FT seems to be the preferred Stop Motion capture program used by experienced Stop Motionists who use Macs, however, there are complaints that it needs to be updated, however, will you pay for newer version? FrameThief is only $40.(USD). Perhaps, the software creator, Roman Blok should receive more $$$ compensation (raise prices) incentive for him to keep FT up to date. Framethief offers no customer support, even if you buy it. They have a FAQ section that is primarily old archived postings. A bad omen and puts Framethief in the Abandon-Ware category. AnimAide XT for Macs. This is a 'new kid on the block'. It looks like this is a full featured software that can be a possible Frame Capturing choice for you Mac people. Someone contacted me and said, "very satisfied with AnimAide XT". I do not use Macs, but looking at AnimAide XT features; to me it seems similar to FrameThief. AnimAide XT compatible with DV camcorders and webcams and 'some' interface features with Digital Still Cameras. Also has an interesting 'voice syncing' feature. Their support link has an online manual for you to look over, and of course, a Free Trial Download too. Why don't you test it out? Give them feedback. Guess how much AnimAide XT costs? I cannot believe this .... it is only $40.USD! Note: Only has Onion-skinning. You cannot toggle back to previous frame. Go to AnimAide XT main page for download trial & provide feedback. I Can Animate is an animation software created in England. All you Mac people should behappy. This is only for you! It looks like it is also geared towards education market and has some good basic features. It works with DV Camcorders and Mac compatible Webcams. It has onionskinning, you do limited layering, it has time lapse capturing and something not found in many other Stop Mo programs ..... chroma-keying and some limited image retouching features .....for example, if you need to remove wires or rigs or do some kind of special effects. The user interface design appears to be easy to understand so kids or beginners can grasp it quickly. Their prices are in English pounds so you will also need to contact them to see how much it costs in US dollars I Can Animate Update: I do not see on their website if they offer a trial demo download? Their website does not say. Suppose, for some reason, it does not work in your computer configuration, (it can happen) or you do not like the interface? You might contact them and inquire about that. They do have an online basic manual (pdf file), but IMO, trial demo would be better for testing. Simple easy interface with solid basic features for Stop Motion training & learning for personal or school (free). 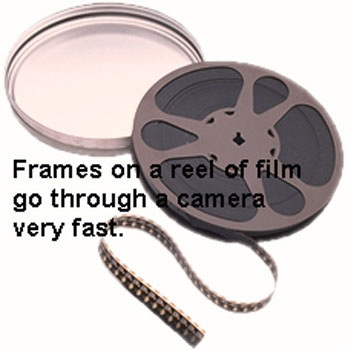 Frame by Frame (Mac) A small program created by someone and offering it as freeware. For Mac users who want to practice Stop Motion. Helium Frog (PC) A free program that is in very Beta status and appears by someone who writes programs as a hobby and has interest in Stop Motion. Lip-Dialogue Syncing: Only a very few of the above Stop Motion programs have dialogue lip syncing, however, you can use separate programs to perform this function. So just because a Stop Motion program does not have lip syncing, IMO, it does not mean it is of lesser quality. You can use these additional programs here. Most of the Stop Motion Software saves as uncompressed AVI file format which are very large and can use up much hard drive space. If you want to free-up your hard drive, you either save AVI on another hard drive or output your work to mpeg format for burning onto DVDs, or you do further compression for the small QuickTime, Windows Media or Real Media players for online viewing of movie clips. Many programs available for digital media conversion and also QuickTime Pro can do some media format conversions in addition to compressing. DV Camcorder & Still Cam with Animation Feature: This is the only consumer digital camcorders that I know of, that can shoot single frames without having to be connected to computer ..... Sanyo's IDshot digital disk camera. It uses no video tape and the images are stored onto Sanyo's Magneto-Optical Disk with a large 730MB storage capacity which acts as mini hard drive in the camera .... you just use it over and over. The IDshot's animation feature is not as good as a DVcamcorder camera connected to Computer & using Stop Motion Software. It is a quirky camera, however one can do variety of workarounds for animation IDshot Tutorial. Also you should know .... IDshot still image feature is just 1.5 megapixels which for a still cam is weak compared to dedicated digital still cams. Update 04/05: The IDshot is not produced anymore but it may be available for a brief while until the suppliers get rid of their stock. IDshot was a unique product and too bad Sanyo did not continue with improved versions. IMO, Sanyo's marketing of IDshot was bad, and it was initially overpriced and some of its features & user interface were weak. Some camera vendors where you might be able to get it: Sales Store (Florida, USA) is about the only place I know where they still have new models collecting dust, but I am not sure if they carry spare optical storage discs. You can try eBay too. Online detail description about Sanyo's iDshot and IDshot & Stop Motion. Idshot certainly a rare consumer product that had built-in Stop Motion feature .... a collector's item now, maybe. So, for every frame, you click TWICE; you click one frame for the video frame grabber, and click one frame for the digital still camera. and also interfaces with digital still cams that have remote capture. SMMadv copies Hi Res Still Images into sharp & crisp BMP images for AVI exporting to NTSC or PAL video. PC .... does stop motion video capture animation with built-in remote capture for some Canon digital still cams. It works similar to Stop MotionMakerPlus .... the hi res still images are better image quality than video cam and can be exportedto NTSC or PAL for much sharper video quality. I am not sure if we all have been brainwashed already with the over abundance of hyperbole by the media (& self interested parties) which seems to be proclaiming, that Digital is the panacea to all of our world problems? 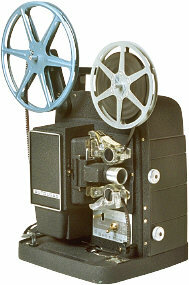 Well, I should let you know that, before digital took over the planet, there was something called Movie Film! YES, it is a long strip of thin plastic material that you thread through a Movie Projector and you actually see the images moving on a screen . Pretty amazing, huh? How primitive, you say? Stop Motion can be shot using a "Movie Camera" ..... professional film formats are 35mm and 16mm which can be very costly especially if you are a beginner and also there is a big learning curve ...... knowing about film exposures settings, depth of field, focusing, film type selection, ad infinitum. In the "old school" days (Already?....I am not that old-!) 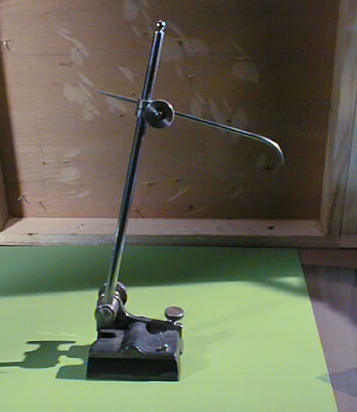 there were no computer frame capturing tools where one can instantly playback and view the animation. We had to WAIT for the movie film to return from the processing lab so that we could then see the results of our animation or if we made made mistakes. Yes indeed, perhaps a tedious way to learn but eventually, with much practice & perserverance via the old methods, the mind almost becomes like an internal frame grabber, where we can mentally visualize and remember the movements .... much concentration is required. The great masters of Stop Motion acquired this skill. Super 8 film not as easily available at your local drugstore, but one can always purchase directly from Kodak and even though you may think of them as a large impersonal corporation, they provide good service to the "little people"
Soooo, you want to retain that softness and unique film look quality, but would like to edit on the computer and release your animated movie film on VHS tape, VCD, or DVD? Well now you can and at very cost effective prices. 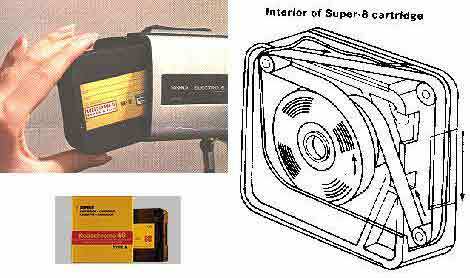 MovieStuff will transfer your Super 8 animation TO miniDV tape.....you then insert DV tape into your DV camcorder......connect 'corder to computer via firewire, then download onto the hard drive. So remember .... everything is not free! If it is a hobby, past-time, activity you enjoy .... one devotes some time, effort & money to it. How much cash do you spend on music CD's, DVD movies, monthly Cell phone bills, high speed internet .... or on any of your other habits? If you have suggestions, comments, or corrections or if you discover any new Stop Motion program-software-tools ...... please share and let me and everyone know. Also, if you have actually tried some of the above products .... give us your opinions or feedback.You are very welcomed to contact me.